That is why I could not resist this recipe when I saw it on Joy’s blog – and I’m glad I didn’t, because these little cookies are delicious. Preheat oven to 160°C/325°F; line two large baking sheets with baking paper. Sift the flour, cornstarch, baking powder and salt in a bowl. Set aside. Combine the butter and confectioners’ sugar in the bowl of an electric mixer. Beat on low speed with the paddle until well mixed. Increase the speed to medium and continue beating until light, about 2 minutes. Beat in the eggs one at a time. Batter may look broken and curdled. Beat in the juice and zest. Decrease the speed to low and beat in the flour mixture. Remove the bowl from the mixer and give the dough a few good turns with your spatula to bring it all together. Arrange rounded teaspoons of the dough on prepared pans. Space the balls about 5cm (2in) apart. After all the cookies have been placed on the pan, flour a fork and press a crisscross design into the top of each mound of dough. Bake the cookies until they spread and become golden, about 20 minutes. Slide the parchment paper off the pan to cool completely. Scrumptious and cute looking cookies.. These look lovely - I am thinking of making them for a visiting gift to take to friends. 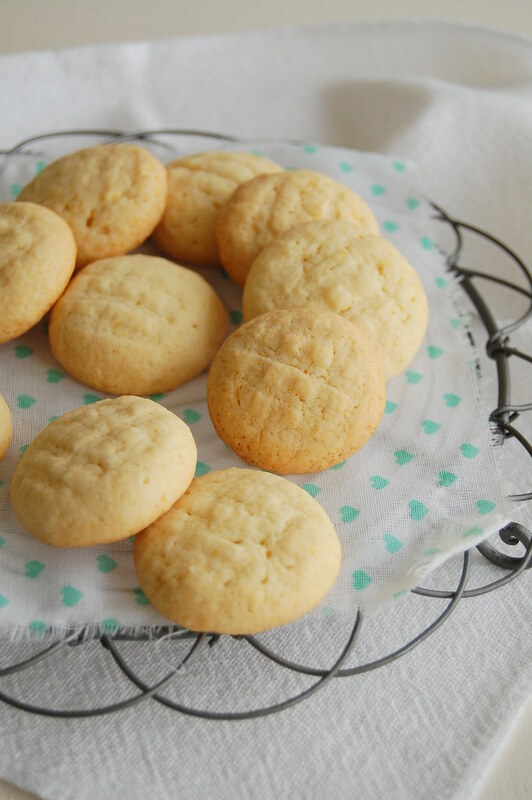 Lemon Cloud Tea Cookies... Sounds so heavenly, and look's great ! Gorgeous photos ! They are now baking in the oven. Priya, thank you for stopping by! Heather, thank you! I hope you give these a go! M., I love anything lemon, too! Thank you! Tarah, thank you for stopping by! I can see why you couldn't resist making these!! I've finally got them posted. I've made a few more things from your blog, all of them are very delicious too. Will notify you once I post them.